Have you guys heard of Stamen? Chalk this up to one of the cooler things I’ve found on Pinterest. 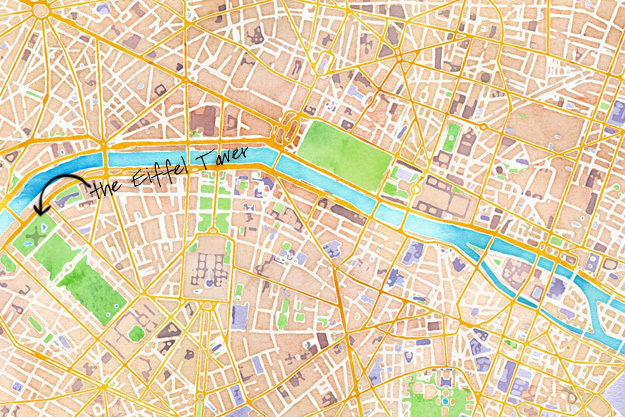 You can make maps of anywhere in the world in a variety of stylized versions, including watercolor. So obviously, my first thought was PARIS WATERCOLOR MAP. Suddenly Philadelphia looks a whole lot prettier. Paris always looks pretty, I don’t care what sort of artistic overlay you give to that city. I’m back to work today for the first time in two days. I’ve been home sick with what I’m pretty sure isn’t bird flu, but still totally felt like bird flu, what with all the hacking. I didn’t have a fever, but oh, there was a lot of phlegm. And now that I’ve successfully nauseated all of you, I’ll go ahead and wrap this post up. Whoa, WHOA!!! I’m pregnant – there’s no rhyme or reason to the things that nauseate me these days. i hope the bird flu isn’t back (isn’t it back in china or something?). we had the swine flu once when it was going around. that was pretty terrible. glad you are feeling better and hope you really are feeling much better!! my kids are sick and i am just crossing my fingers that it doesn’t get me. but i am not that lucky so i am sure i am doomed. oooo, i love these maps. it’s so much fun to play around with. xoxoxo! Oh man, see that’s what I get for making jokes about actual viruses. Nope, not really bird flu (although it is apparently back with a vengeance in some parts of the world). I can’t believe you guys had swine flu! That must have been a nightmare, gosh. Thankfully you all came through it okay! Oh wow! I bet Norfolk would be really pretty since we’re surrounded by so much water. May need to tuck this away for Father’s Day…I’m sure Neel (I mean “I”) would LOVE it! I pinned this and tried it out and it makes any city look gorgeous!! And I hope you’re feeling better. Yikes – feel better soon so you can do fun stuff over the weekend! 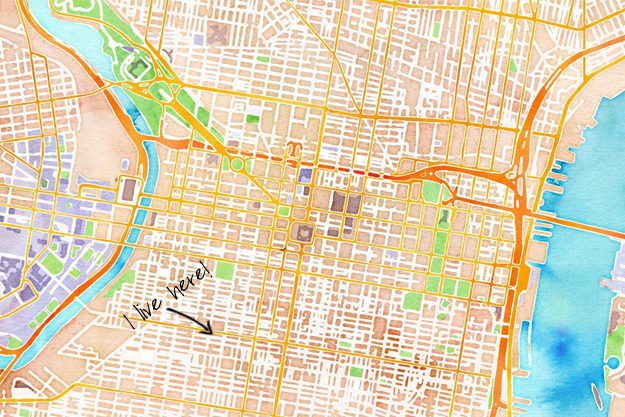 I’m such a sucker for maps – these are gorgeous! Hope you feel better soon! I just saw these yesterday! So much fun to play around with.